Small swivel head trunnion snap shackle allows both 360 degrees rotation and side to side articulation. SKU: RF6411. Categories: Small D Swivel Bail Snap Shackles, Snap Shackles. 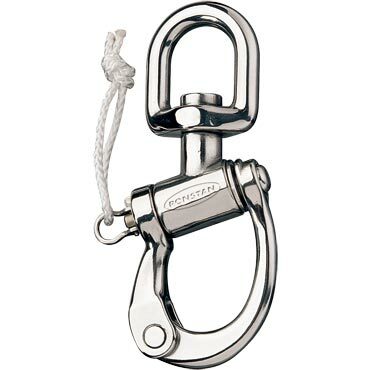 The RF6411 is a small swivel bail stainless steel snap shackle with a breaking load of 13,230lbs and weighs in at 13oz. This item is available in a polished finish or black oxide. B. L. : 13,230 lbs.